This radio station was once used to contact Bandung in Java (formerly a Dutch colony). As all conductive structural materials such as wood and nails were ruled out, the choice fell on solid concrete, at that time an unknown medium. There was no clear brief to hand. 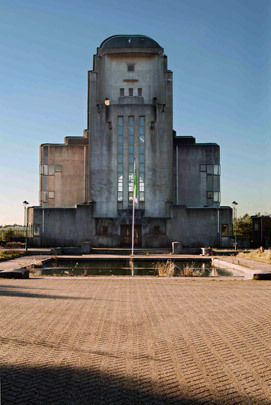 The radio mast and the main volume behind it give the impression of a towering, symmetrical cathedral, with seven tall windows, stepped roof, concrete structural ribbing and a floor pattern in black and white tiles. Once threatened with demolition, this national monument now serves cultural ends.